A newspaper article published by The Lion's Tale, Oviedo High School's student newspaper, in February of 1984. This article is about OHS senior Ed Norton, who was chosen as the recipient of the La Sertoma Club award. The La Sertoma Club is an international, non-partisan, non-political, non-profit, and non-sectarian organization that focuses on youth and community needs and scholarships for over 80 years. Original newspaper article: Walter, Cheryl. "Norton Awarded by La Sertoma Club." The Lion's Tale, Vol. XIII, No. 5, February 1984: Private Collection of Dan Beistel. 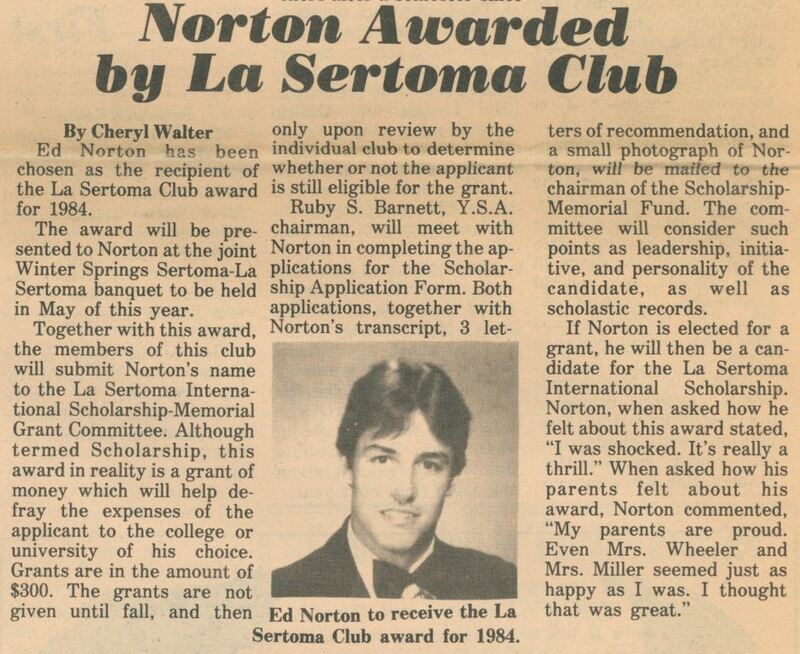 Digital reproduction of original newspaper article by Cheryl Walter: "Norton Awarded by La Sertoma Club." The Lion's Tale, Vol. XIII, No. 5, February 1984. Originally created by Cheryl Walter and published by The Lion's Tale. Walter, Cheryl. 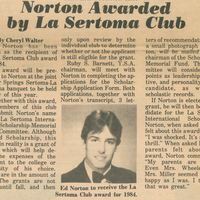 “Norton Awarded by La Sertoma Club.” RICHES of Central Florida accessed April 18, 2019, https://richesmi.cah.ucf.edu/omeka/items/show/5270.